Adolescence is a period of rapid growth and development. The release of hormones triggers the physical growth that we can easily observe. However, what we can’t see is that the corresponding growth and development in the adolescent brain is equally accelerated. Recent advances in research using MRI has shed light on many of the typical behaviors associated with adolescence, especially risk-taking (Steinberg, 2007). Understanding adolescent brain development provides important information for supporting teens as they navigate this often challenging period of development. What’s happening in the normal brain during adolescence? During normal development, the brain is streamlining and strengthening the neural pathways to create more efficient systems of communication. MRI imaging has documented that the majority of this streamlining and strengthening occurs in the frontal cortex, the area responsible for decision making and higher level thinking (Casey, 2007). If this is true, then how can we explain teens’ impulsive and risk taking behaviors? The answer lies in the limbic system, a different part of the brain that is also developing during adolescence. The limbic system is responsible for reward seeking and is stimulated by social (peers) and emotional variables (Steinberg, 2007). The limbic system develops earlier and faster than the cortex, meaning that until the cortex can catch up with the limbic system, the desire for rewards and social pressures overrides rational thinking (Steinberg, 2007; Galvan, 2007; Casey, 2007). The temporary imbalance of development of the two systems challenges many of the traditional strategies used to help teens make good choices. In fact, teens and adults have a similar capacity to distinguish between risky and safe choices. It’s just that teens are less able to make the right choice in the moment (Casey, 2007). What does it mean for my work? This can be tough, since teens also need opportunities to gain independence and confidence. The following suggestions may be useful to you as you help families find an appropriate balance between safety and autonomy. Educate families and teens about what is happening in the brain; emphasize the need for increased structures and limits during this period. Remind families that talking about good choices isn’t enough to ensure teens make those choices. Help families develop clear expectations for behaviors, such as staying in contact when away from the home, access to the internet, driving, dating, etc. They should discuss those expectations explicitly, reviewing them often. Make sure that families limit access to alcohol, cigarettes, and drugs (including prescriptions). Encourage families to know who their child’s friends are. Remember, in the presence of peers, teens’ desire for potential reward can overpower the concept of right and wrong. Provide opportunities for structured risk taking by encouraging teens to try new things (sports, music, art, etc.). Help teens learn skills that support independence, such as budgeting and job applications. Whenever possible, allow teens to make decision and have control over their lives. Support healthy brain development by making sure teens get enough sleep, physical activity and healthy nutrition. In the last issue of Practice Notes, we focused on trauma and the impact it has on brain development. Traumatic experiences shape brain pathways, disrupting normal development. For adolescents, this can affect the development of the frontal cortex, further slowing the timing of and capacity for higher level thinking. Traumatized teens are even more likely to engage in risk-taking behaviors; their need for structure and support is even greater. Walsh, D. (2004). WHY do they act that way? A survival guide to the adolescent brain for you and your teen. New York: Free Press. In 2007 Mike Males, a senior researcher at the Center on Juvenile and Criminal Justice, had a strong reaction to news coverage of scientific findings about how teens’ “immature” brains made them especially vulnerable to risky behavior. Males responded with a New York Times op-ed piece in which he suggested the aim of our focus on the shortcomings of teens may be to draw attention away from the fact that it’s really middle-aged adults who struggle with risky behavior and poor choices. As Males put it, “what experts label ‘adolescent risk taking’ is really baby boomer risk taking.” To back that up, he cited statistics about Americans aged 35 to 54, including those outlined below. Males’ central point is that we need to keep things in perspective. Based on the data he presents, it might seem reasonable to worry whenever you’re around someone who’s middle-aged. But it’s not. We agree. If you work with adolescents, chances are you can easily think of teens who have demonstrated remarkable insight, self-control, and good judgment, even when faced with peers who disagreed or other challenging circumstances. 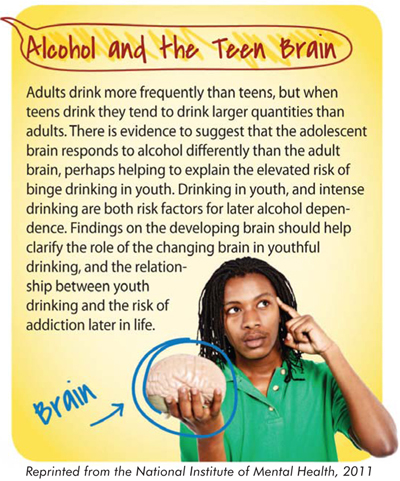 We think we’ve done a good job sharing information on teen brain development, and we hope you consider it. Science is worth paying attention to. But we also hope that as you reflect on your practice with teens you’ll draw on your own experience and wisdom—and theirs—to identify strategies to help them reach their goals.